One way to understand something is to look at another thing. 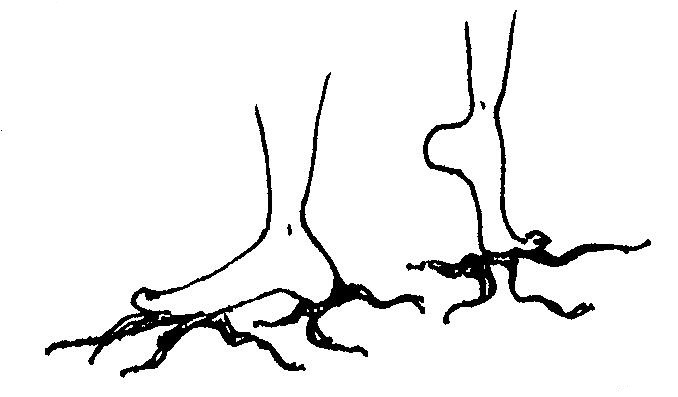 The Body’s Way is really Nature’s Way, so what can I learn about my feet by understanding roots? Most tree roots grow in the top 18 inches of soil – spread platter-like under the tree. For balanced movement, spread and relax your feet. Unclench your toes and your heart may follow. In winter, tree roots don’t go dormant but instead are resting and poised for even a few warm days to enliven and grow. Keep relaxed aliveness in your feet and You will leaf from there.